We are currently offsite at the American Astronomical Society 231st meeting in Washington, DC. So, this blog post does not have any telescopic observations or images, but does have a few comments about the pre-meeting workshops and some good news about the upcoming eclipse trip to Chile in 2019. So, where are you going to be on July 2, 2019? Remember this date is when the next total solar eclipse occurs in Chile and South America and that we had been trying unsuccessfully to book some sort of trip to see that. Well, we finally did find a tour that was going to include that eclipse event along with a chance to see some of the observatories high in the Atacama. It is more expensive than some of the other sold out tours, but at least the stock market is up and going higher and the final bill is not due until 2019. Resident Astronomer Peggy, who was initially not so excited about July in Chile, which is their winter remember, but she eventually agreed and we also tacked on a side trip to Easter Island at the same time. So, hope to see you there as well! In the meantime, I am at the AAS 231st meeting in Washington, DC, and I don't know why they had to hold the meeting in the winter, especially at a time when the temperature in DC got down to 7 degrees F. Brrrr, that will be cold, and my California blood will stop in its tracks, but luckily, it was only that cold on the first travel day. 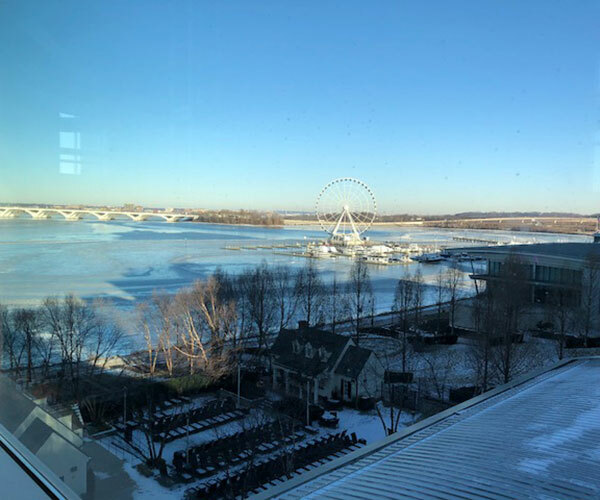 The Potomac is a bit icy, along the edges, but at least everyone in Washington has a chance to be a big wheel! The wheel was often turning, but I couldn't quite tell if anybody was actually in it with the cold and all. Checking in at the meeting hotel felt a little bit like the bar scene in the first Star Wars movie. The lobby was packed with hundreds of strange folks mostly all dressed up, looking every bit like the aliens in the movie. It turns out that just as AAS meeting workshops were beginning the Magfest (www.magfest.org) were just finishing up their 4 day event that brought together all sorts of young folks interested in music, gaming, light sabers, strange characters, and aliens of all sort. They were having a lot of fun and keeping me awake until the early hours. 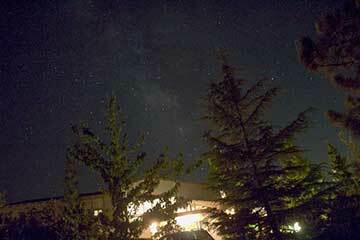 I guess it is not only astronomers that have fun at night! 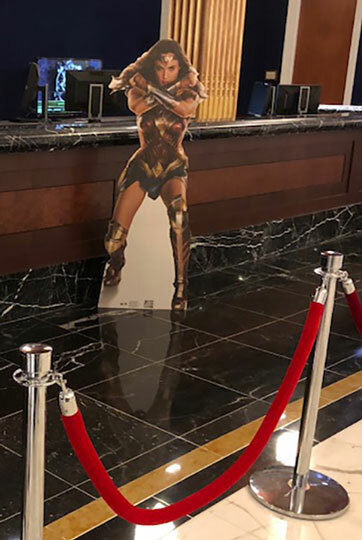 Why is some Wonder Woman greeting me as i check in at the Gaylord Nation front desk? The AAS meeting is spread over many of the hotel and convention center ballrooms and meeting areas. Luckily they have developed a smart phone app to help all of us visitors find our way around and keep track of the next speaker that we have put on our schedule. This app really haps and has maps of the place to help get around. 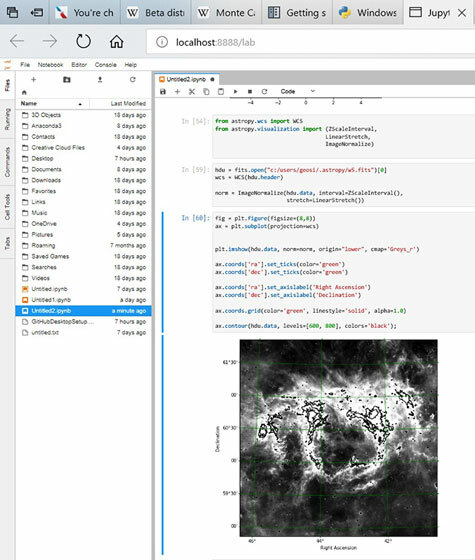 I signed up for one pre-meeting workshop on using Python and various Bayesian statistics algorithms to analyze data collected from observations of various astronomical objects. If you are like me, I had a class in frequentist statistics, but at that time the interest in Bayesian statistics was not covered much in any of my classes. It turns out though that Bayesian statistics is much more in keeping with the scientific method and doesn't assume anything about the population statistics of the objects being studied, and in fact treats those statistics as one of the parameters being measured. You start with some assumptions, called the prior estimates, and then based on observation, you update the priors to become the post prior estimates of the variable in question. For example, in the slide below, taken from the presenter, Professor Tom Laredo's presentation, you can see some examples of the types of populations being considered. The goal is to derive general conclusions from a small set of observations and be able to show that this small sample accurately and correctly predicts how the entire population is expected to behave. 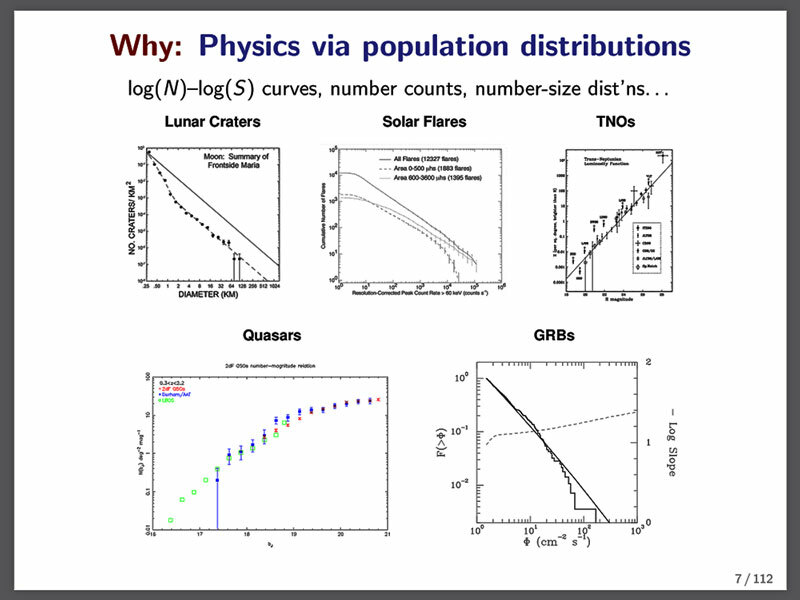 This workshop was mostly over my head in the details, but I did come away with a better understanding of the Bayesian approach and how to incorporate some of the software packages, such as Stan, JAGS, and R, into programs written in Python, which is becoming the number one programming language for astronomers. My goal is to learn how to program in Python. Luckily, When I was doing engineering work, I did some Fortran, Basic, Assembly, and C programming projects, so I sort of knew what to expect from this introduction to Python. 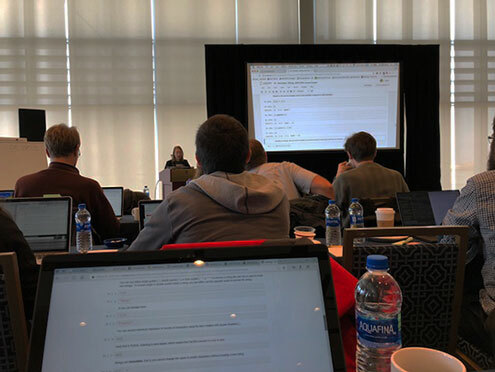 I was able to get in one of the second workshops, which was an introduction to Python programming and its astronomical add on tool kit called, Astropy. The workshop was a good combination of tutorials with plenty of time for us to do our own Python programming on our own laptops. One example of what I learned was how to process FITS files and display the image and be able to do some special processing on the image. My first example, again thanks to instructor, David Shupe's examples, is shown below. Remember, that FITS, which stands for Flexible Image Transport System, is widely used in the astronomical community as a standard that allows for ease of sharing of images, each collected on a different telescope, to be shared and analyzed from a common interchange. So, that is pretty much it for the 2nd day of pre-meeting workshops. It has been pretty cold outside, and actually raining right now, but luckily we don't have to go outside for the meeting. Anyway the outside temperature now is back up in the 30's. Besides, my mother used to tell me to drink plenty of liquids during the cold season, so I am trying to do that! 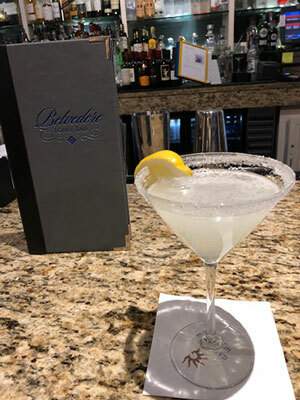 I can't seem to remember if this drink is what she had in mind, but at least the martini has citrus in it! Ok, tomorrow is the official first full plenary session kickoff of this 231st meeting. There are a lot of interesting sessions coming up and I might be able to report back about some of the interesting findings.